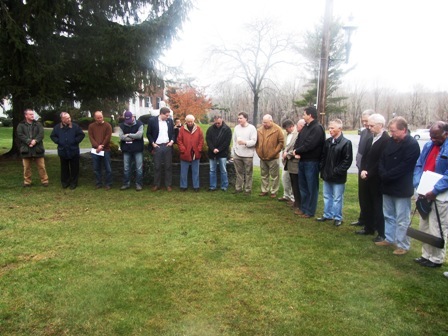 On December 8, 2012, on the Feast of the Immaculate Conception, the St. Lawrence Men's Cornerstone held their annual retreat. 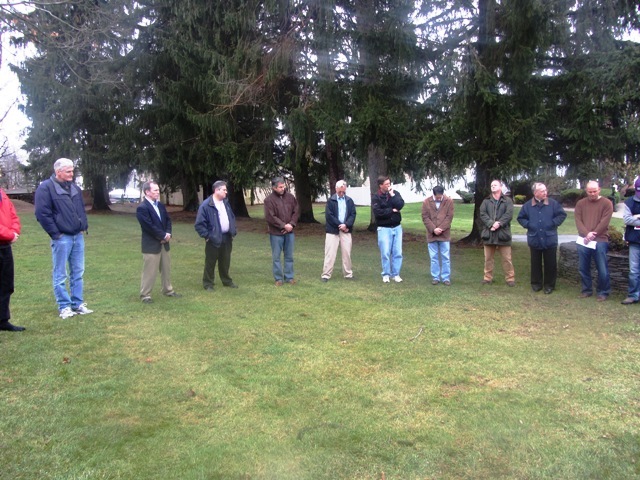 Over 50 men started the morning by attending the 8:00AM Mass together in the church, It was appropriate as the theme of this year's retreat was "Community" and what better way to show off our great community than to have a group of 50 men enter the church together and sit together during one of our parishes early morning Masses. Special thanks go out to Tom Brandt, who coordinated the entire morning, starting at least a month prior to plan and execute this wonderful day. The morning was pulled off flawlessly and so far, we've heard nothing but great things about the reunion (read all the way to the bottom to see a note from Fr. Lance). Below is a brief recap of the morning. 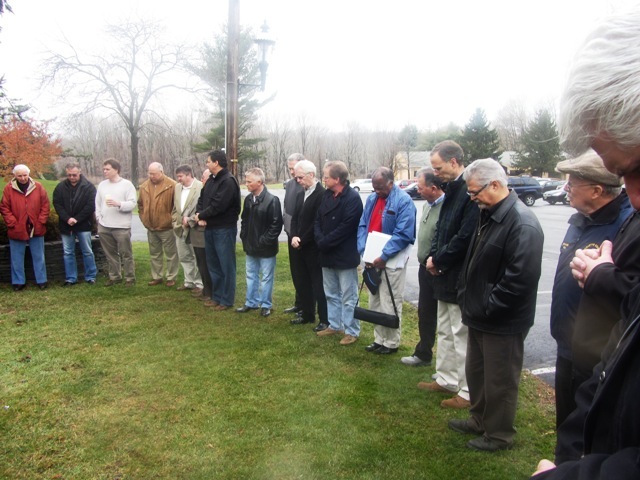 Introductions: Father Paul started off the morning with an opening prayer and Tom Brandt gave an opening welcome to all the men gathered in the parish chapel. Tom Fuscaldo gave an overview of the current CS Team 9 that is working on Hosting our 10th Annual Cornerstone Retreat Weekend. Anthony Papili followed Tom with some general information about the current status of Cornerstone at St. Lawrence (roughly 182 men have attended one of our retreats and roughly 102 had joined team). Lou Villafane then spoke about the Feast of Guadelupe and invited all to attend the Mass and celebration that night. Tom Saitta: Tom Saitta followed Fr. Bob (with little expectations since the bar had been set so high). Tom gave a great talk on what community means to him, providing several examples of Community he witnessed over the past month right in our own parish during Hurricane Sandy. He let everyone know that no matter how little the gesture folks make, it definitely does make a difference to your community. He closed his talk with a touching video on Its a Wonderful Life which was a tribute to his witness. Dave Galdi: Dave shared with us the story of his childhood, and growing up with his father always giving him the assignment of the "15 minute chores". Dave shared with us how his experiences of having to work as a child when his friends were all out playing, really helped him learn how to make the best of a tough situation. Both Tom and Dave quoted Walt Michura in their talks, claiming, "Just Do Your Lowsy Best, and Let God Take Care of the Rest". He also referenced a few other Cornerstone brothers who left an impression on him. One particular that he highlighted was Tim Iversen's oath to "Say Yes for a solid year!!". After Dave's talk, there was alot of spirited talk amongst all the Cornerstone men. Several men thanked both Tom and Dave for giving their talks and shared with them exactly how much they have both touched so many lives throughout the years. Deacon Frank: In classic Deacon Frank fashion, he opened up his talk by sharing two scripture readings and then sharing with us his witness on "Community". His message about how wonderful God is as he made each of us unique and with our own talents, and how each of us has something to contribute. He spoke of how the Community of St. Lawrence really helped him out in his time of need and how it is important to see the beauty in everything we look at (another quote from Walt). Candle Ceremony: In a very fitting show of Community, we all went outside to the church lawn in front of the Statue of Jesus, and concluded the morning with a beautiful candle ceremony, kicked off by Tom Brandt, as he made his special intention then passed the candle around the large circle as each Cornerstone Member held the candle as he made his own special intentions known to the group. 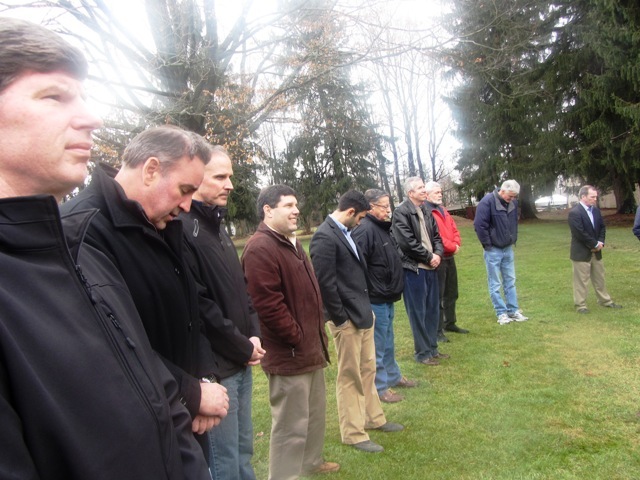 Hopefully passers by saw and will question what all those men were doing on the Church lawn. As was stated in many of the talks during the day, we lead by our actions, not by our words, so hopefully the actions of public prayer will raise awareness of many and get more men involved in this wonderful community called Cornerstone. As is tradition, we finished the morning, arm in arm as we all recited the "Our Father". Below are some photos from the Candle Ceremony. Below is a message Bill Novick received back from Father Lance when he let him know about our successful Cornerstone Reunion. We wanted to make sure this got shared with everyone. created a Godly atmosphere and readiness for the retreat. you could have been there! !